Tuesday 20th, December let the V Villas Hua Hin chefs take you and your family on fantastic culinary journey of a superb dinner by the beach that also includes a premium selection of cheese paired with top quality wines. With quality cheeses including Blue De Gex for Raclette and cold cuts such as the sumptuous Jamon Iberico Recebo, pairing with the unambiguous Valdelosfrailes Wines, which include the award-winning ‘Vendimia Seleccionada 2005’ and the ‘Prestigio 2001’ that was awarded 90 points by Robert Parker in 2011. Tuesday 20th, December 2011 from 18:30 hours onwards. Priced at only THB 750 nett per person. 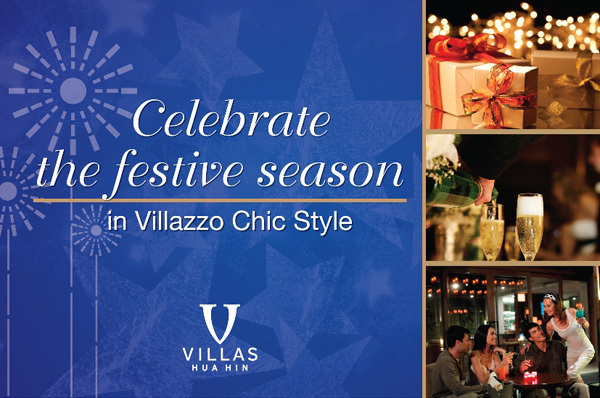 Come celebrate the joy of Christmas this year with Villazzo Restaurant’s fantastic European set menu that includes a range of traditional delights and seasonal favourites. Saturday 24th, December 2011 from 18:30 hours onwards. Priced at THB 4,000 net per person. Take a stroll with us by the poolside and beach lawn at V Villas Hua Hin, welcome the New Year with cool sounds of jazz. Savour on a grand beach BBQ where there will be an array of premium meats and freshly caught seafood, carving stations, and delicious desserts to enjoy with live jazz from local talent. Enjoy this luxurious gala dinner with the relaxing wind, sound waves, and the sky full of stars. Continue the celebration as we gather with marshmallow over campfire and at the stroke of midnight by the peaceful beach we release hot-air balloon into the sky. Saturday 31st, December 2011 from 18:30 hours onwards. Priced at THB 6,500 net per person. Book now to experience the pleasurable breaks with our, luxurious and peaceful, V Villas Hua Hin. The fabulous resort that provides you with accommodation in a spacious Pool Villa Suite inclusive of breakfast, in-room Wi-Fi internet access, use of an iPad II during your stay, 24-hour butler service, and full mini bar services. • Christmas eve and New Year eve dinner is compulsory with room booking on that dates. V Villas Hua Hin, recently received the Five-Star Hotel Thailand Tourism Standard certificate for 2011-2013 from the Department of Tourism, Ministry of Tourism and Sports Thailand that certifies that the hotes has been assessed and found to be conform with the requirements of the Thailand Hotel Standard Foundation. V Villa Hua Hin was recently included in the Luxe List in DestinAsian magazine, the leading travel and lifestyle publication in the Asia-Pacific region. 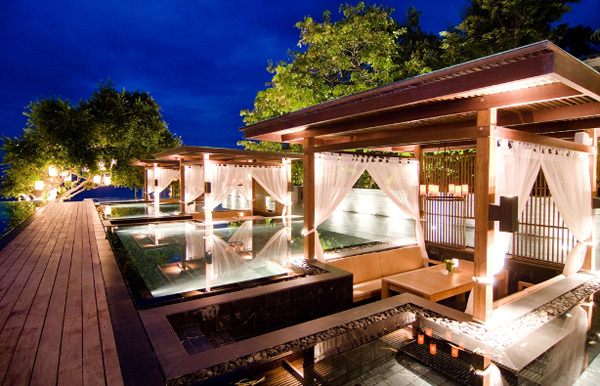 The hotel also received the “Best Luxury Hotel - Anywhere Travel Award” as voted by readers of Anywhere magazine, one of Thailand’s top ten lifestyle and travel magazines.